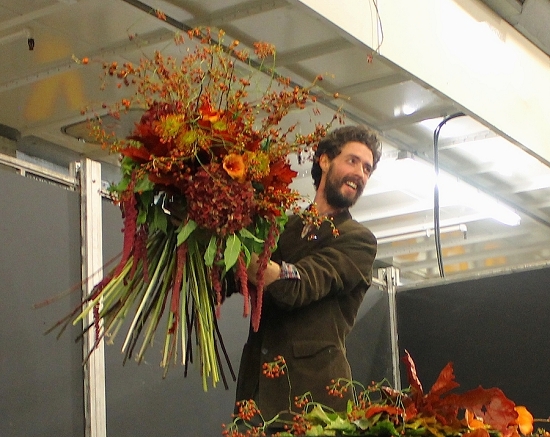 Five hundred floristry students filled the Flower Market on Wednesday 5 November for a fun-packed morning of talks, tours, competition and Flower Market Shopping, topped off with a spectacular floral demonstration. 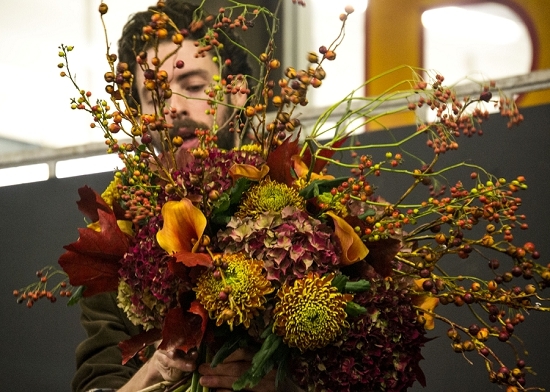 The Level 2, 3 and 4 students from 23 colleges from across England had come together for the Flower Market College Day, by now a highlight in the floristry college calendar. Dressed warmly for the nippy Market temperatures, many had been travelling since 3am to take part. 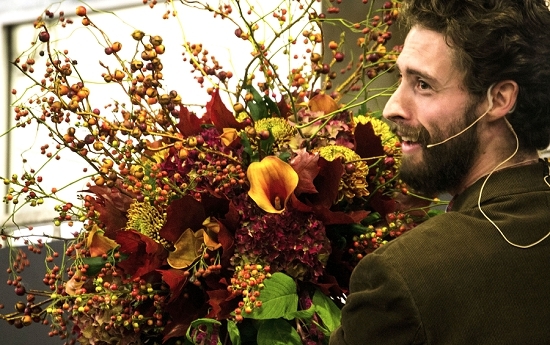 Fuelled on Market butties and hot drinks, the Level 2 students soaked up the expertise of 4th generation foliage expert, Barry Porter of Porters Foliage, in his mind-blowing introduction to the world of foliage, a new feature for 2014. More experts followed: Leonie Bear of Pinstripes & Peonies and Maureen Furey of Bella Fiori shared their decades of purchasing expertise covering everything from picking the right flowers for the right job through to how to pricing and quantities. Students flower identification skills were tested to the max with the all-new Name that Flower Trail, which took students on a floral treasure hunt to stands around the Flower Market. The Flower Market Shopping session saw students swoop upon the sundries stands of Whittingtons, Pollards, Donovans and Paul Mitchell and the treasure trove of C Best. Meanwhile, teams of Level 3 and 4 competitors were tasked with creating a wall display for a Bonfire Night Party (well, it was 5th November after all! 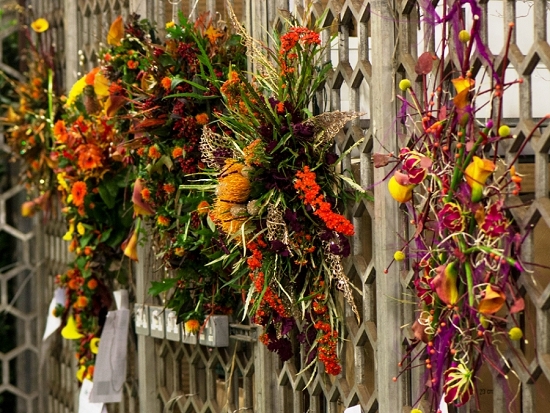 ), sourcing fresh flowers and foliage in the Flower Market to a tight brief and a tight budget. The results were stunning! 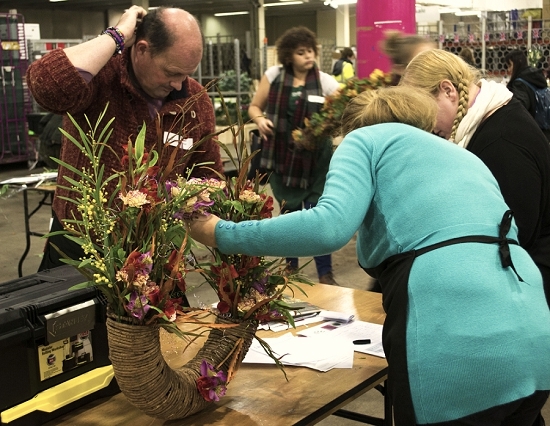 Our thanks go to the UK Floristry Judges Guild for their expert judging of the teams' magnificent designs. As the hour approached for the Grand Finale, there was standing room only in the Flower Market Stage Area as students, tutors and florists alike angled for a view. They were not disappointed! 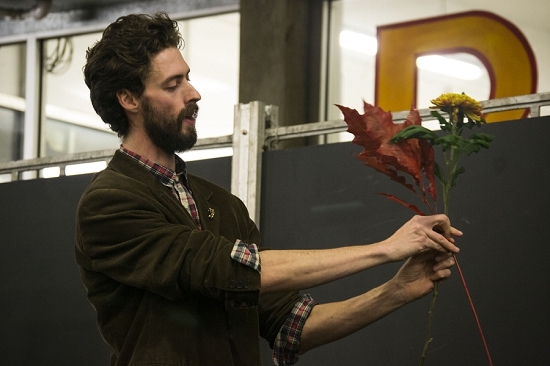 The wonderful Francis Rushby of renowned florists McQueens gave a truly inspirational demonstration, starting with the largest hand-tie the audience – and compere Rona Wheeldon of Flowerona – had ever seen! In rich autumnal shades, the design sat neatly inside a barrel, a witty nod to the Gunpowder Plot! There followed an elaborate table design and then a McQueens style installation of birch pedastals and amber tones for maximum impact, all the while peppered with fascinating insight into the world of McQueens. Students snapped some great shots of themselves during the Flower Market College Day for the #FlowerMarketSelfie competition. Our winner was the sunny Megan Jane with her sunflower backdrop! A special thank you goes to our sponsors ECT Travel and to student photographer Emma Palmer who captured the event.